The major avenues of Chandigarh, with important institutional and commercial buildings located on them. E.g Madhya Marg, Dakshin Marg, Jan Marg, Himalaya Marg, Uttar Marg and Purv Marg. Roads bisecting the sectors with shopping complexes located along their southern edge. Roads meandering through the sector giving access to its inner lands. Roads coming off of the V-5s and leading to the residential houses. Foot paths through green belts enabling pedestrians to cross sectors without having to cross vehicular traffic and cycle tracks. Cycle tracks through green spaces. Buses were to ply only along V2,V3 and V4 roads. With the increase in population, economic status of the residents, modern machineries and need of fast locomotion, the administration of Chandigarh had worked for the continuous increase in the development of national highways, internal city roads, and rural roads, in last decade. The length of roads throughout the city has almost doubled from 1,764 km to 3,149 km in last 15 years. As per the information obtained from RLA Department, Chandigarh; more than 3,58000 four wheelers, 4,494 buses, 10, 937 goods vehicles, 219 tractors and 6,68000 two wheelers were registered with the city till 2015. With the total 10,50,299 registered vehicles, the city now having the highest per capita ownership of motorized vehicles in the country. 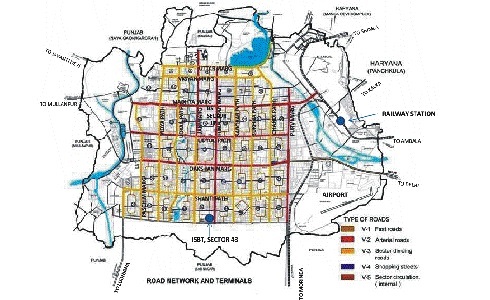 A dramatic increase in daily floating traffic from the extensive urbanization, which has taken place around the city, the problem of traffic congestion is also growing in the city but the well connected network of roads, suitability of traffic signals, very attentive traffic police controllers and remarkable division of different roads helps a lot to control over the situation.